Well I have completed 3 weeks now and honestly it has flown by. The only difficult part is when I am away from home... without my blender! I miss my morning smoothies. Also eating at someone's house is still tricky, but word is spreading pretty quickly that I'm a rawist so it works out... but it's not quite as fun. There's just something about everyone participating in the main meal. I am absolutely loving this and I'm going to go for 3 months straight. I don't think it will be a problem. I feel like I am just now understanding the basics and getting a foundation. I have only scratched the surface when it comes to all the information out there. Everyday I get so excited to sit and read all my raw books. Plants are seriously amazing. When eating raw, plants and green leafy vegetables need to be your staple, that is where you are going to see a change in your body and achieve optimal health. Green smoothies are the way to go. When people start incorporating green smoothies in their daily diet, miracles start to happen. Yesterday I made my first green smoothie. 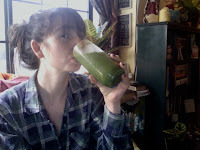 I blended 5 large leaves of kale, 2 bananas, 1 apple, 1 orange, 2 cups water. It made 3 large glasses full. And it tastes great! Not too bitter and not too sweet. When making these smoothies you want to do 60% fruit and 40% green leafy vegetables, then you can make any mixture you want. The lady whose book I'm reading: 12 Steps to Raw Foods by Victoria Boutenko talks about how her husband had problems with his thyroid for most of his life and had nine surgeries for it. It was acting up again and the doctor said he needed to have surgery to remove it, but he refused and asked how long he would live and the doctor said at most 2 months. Victoria's son had a bad case of diabetes and needed to go on insulin. Her daughter was always struggling with asthma and allergies and could hardly walk around the block. And Victoria had an irregular heart beat, that her father suffered from also which eventually took his life, and parts of her body (arms, legs) were constantly going numb. She went to the doctor who said there was nothing else they could do for her and that she should just pray. Since everyone in her family was seriously ill she decided to put everyone on the raw diet. With in one month her daughter could breath normally and actually run a mile without coughing. Her husband's swelling in the throat subsided to normal and his blood pressure dramatically dropped to normal. Her son's blood sugar level was consistently in the normal range now and she was feeling so much better and had good circulation all over her body. She said wrinkles on her face started disappearing and her face definitely looked better and younger with each day on the raw diet. Her family had so much energy now that they had to think of exercises and activities to do to channel this new energy. Then she discovered how amazing greens are for us- they are rich in almost all essential minerals and vitamins recommended by the USDA, including protein. Greens are quite amazing, the cellulose, the main constituent of plants, has one of the strongest molecular structures on the planet. Greens posses more valuable nutrients than any other food group, but all these nutrients are stored inside the cells of plants. These cells are made of tough material, as a means of survival for the plant. To release all the valuable nutrients from within the cells, the cell walls need to be ruptured. This is why eating greens without masticating them (like cows) thoroughly would not satisfy out nutritional needs. This is why blending greens in a Vita-Mix blender is the best possible way to go. Victoria said, "After about a month of erratic green smoothie drinking two moles and a wart I had since early childhood peeled off my body. I felt more energized than ever before. My nails become stronger, my vision sharpened, and I had a wonderful taste in my mouth even upon waking in the morning. I began to feel lighter." And only 2 months after her husband started drinking green smoothies his mustache and beard started growing in blacker, making him look like he did when they first met. All this to say, I am learning so very much and loving everything I am learning. I really don't think I'm going to go back to cooked foods. I just don't see how I could. If we could all exercise self-control and feed our body what it needs we would all live a lot longer and healthier lives, doctors would hardly make a living. I was watching Oprah one day with Dr. Oz and they were researching places in the world where there appears to be a 'fountain of youth' and the secret to all these places was plants. Those who ate a diet primarily of plants and still moved around, exercised, worked outside were 105 years old and still functioning perfectly fine. The old men were riding their bikes to their friend's house, cutting weeds outside, mentally perfect, just everything- they looked like they were 80. It's just like God who designed our bodies to design nature and edible plants to feed our bodies in the exact way we need. How perfectly He has designed everything. How good God is! 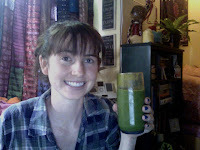 Practice making your own green smoothie and enjoy better health and life!